Just over three years ago I got a definitive Type 1 diabetes diagnosis. Summer was approaching, the weather was getting warmer and pushing my baby daughter’s buggy around in the heat was giving me constant hypos (low blood sugar). The worst case scenario that kept running through my sleep-deprived head was getting a bad hypo whilst out and about. The idea of a sudden hypo coming on, passing out whilst in charge and nobody knowing my medical history or who to call was a really scary thought. There are two things I did for peace of mind. The first was to fill out my Medical ID in the Health app of my iPhone (there's a good set-up guide here). The second was to get a medical ID bracelet. The first I tried was a pretty beaded bracelet but it had an awkward clasp that took me ages to take on and off each day. Next I bought a silicone band - perfectly functional for day to day but more practical than pretty. Recently I had the chance to try the Tangle ID bracelet by Butler & Grace, a company specialising in stylish medical ID ware. What I love about this bracelet is that on first inspection it’s a fashionable chunky bracelet and doesn’t scream medical ID from a distance. Attached to the bracelet is a small disc with the Star of Life symbol of emergency medicine. On the back it can be customised with your own personal information - mine includes the wording ‘Type 1 diabetic - Insulin Pump - ICE (in case of emergency) and my husband’s mobile number). It's made of polished stainless steel and has a big clasp, so is easy to take on and off without asking for help. I’m a big fan of chunky jewellery, so this is actually the type of bracelet I would buy to accessorise an outfit. The fact it’s also potentially lifesaving is an added bonus. Next on my list is to teach my daughters about the bracelet so they can make people aware of it if mummy isn’t feeling well. 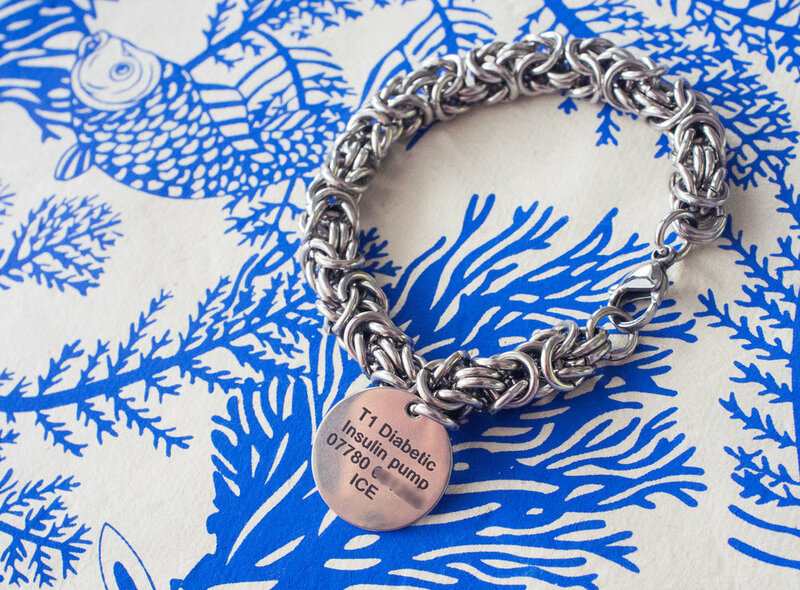 If medical ID bracelets have never appealed to you, I’d highly recommend taking another look. For the full range of Butler & Grace products, take a look here. Butler & Grace kindly sent me the Tangle bracelet in exchange for an honest review. All thoughts and views are my own personal opinion.